THERE is a two-teaclier school in Co. Galway where for the past few weeks the attendance has been only two pupils. The school is the Corgary National School, Mountbellew, and the Manager is Very Rev. 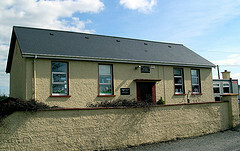 James Moran, P.P., Menlough, in which parish the school is situated. The pupils at the moment are the children of Mrs. T. Murphy, the assistant teacher. The parents of the other children have been on strike for the past few weeks and have refused to send their children to the school. It appears that a dispute arose last Christmas between Mrs. Murphy and the former principal Mr. Martin Dolan, a native of the parish. The school was closed down until a few weeks ago and in the meantime Mr. Martin McDonagh was appointed principal. The demonstration of the parents is a gesture of support for the former principal, Mr. Dolan, and is not directed in any way against Mr. McDonagh. The normal attendance at the school before the strike was about 40 or 50 pupils. This page was added on 03/05/2015. My grandfather was in school there at that time and always said it was tragic, stupid and should never have taken place. Local politics, local church and rural life played a big part. He learned to read and write after coming to the USA.